The Beale Street Blues band was formed in March 1998, hosting an open mic night every Thursday night for eleven years. The bands first CD entitled, Thursday Night Live – was released in April 2000, recorded live with the help of many special guests. Volume II was recorded in the same manner in 2004 and was released in October 2005, again featuring many of Rochester’s best musicians as guests. The bands third CD, entitled “Loserville” was recorded in the studio and was released late last year. 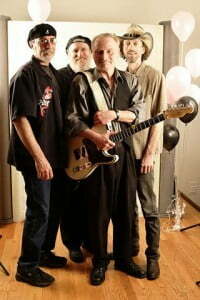 The band features Steve Lyons on guitar and vocals, Sammy G on keyboards and vocals, Ted Mosher on bass and backing vocals, and Don Howcroft on drums. This is one of the few bands to make three different appearances at Corn Hill over the last eight years. The release of their outstanding new disc “Loserville” along with their reputation as one of the areas most popular dance and party bands more than qualifies them for a return appearance.